The 21st Street Loft occupies the 1st and 2nd Levels of 2 turn-of-the-century townhouses that were connected and renovated in the 1960’s by the previous owner. The client wished to retain some of the Bohemian feel of the 1960’s remodel but also wanted to drastically clean up and rearrange the space on a very tight budget. The 1960’s renovation was constructed and designed by the previous artist owners who continued to add to the space with unique, hand-made solutions during the 40 years that they occupied the space. Special care was taken to retain much of the previous owner’s handiwork, yet the space was drastically transformed into a much cleaner, brighter and open space on a very tight budget. 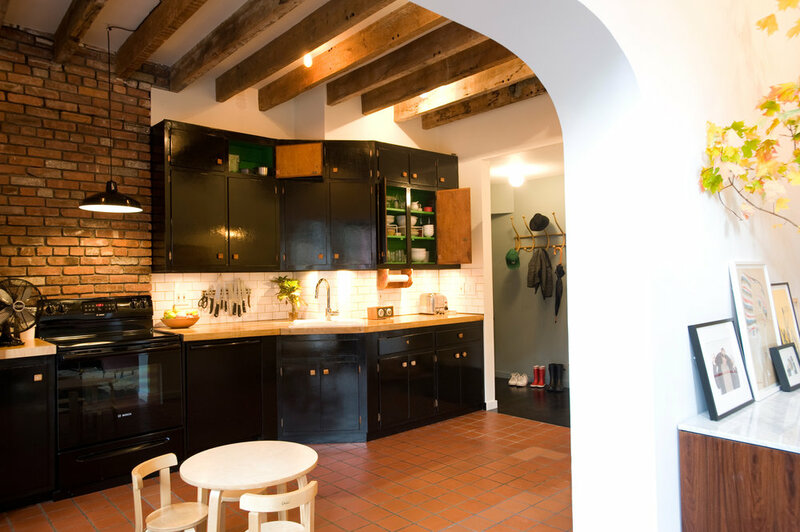 For budget reasons the kitchen cabinets and counters were retained and painted a high-gloss black with bright green interiors. The hung ceiling in the kitchen was removed to expose existing wooden joists and porcelain sockets were added between joists to light the kitchen. The living room was transformed with white paint on all walls and high gloss black paint on the existing windows and doors. The floors on this level were dyed black to achieve a more modern palate. The master bedroom was transformed by removing closets and walls that separated the bedroom from the bathroom to open up the existing sunken tub and fireplace to the bedroom. The new artist owner collaged the original master bathroom with artwork and family photos in order to change it into their own.